Google AdSense is one of the most popular monetization strategies for WordPress sites. There are many ways you can monetize your website using AdSense. It lets you determine the types of ads that appear on your site and you have full control over where the ads are placed. It’s easy to deal with because you insert the code blocks to show where the ads will appear and Google does the rest. Ads can be placed in posts, on pages, in the sidebars, in the header, and in the footer. They can be above or below the content, in-between the content, or you can set the content to wrap around the ads. 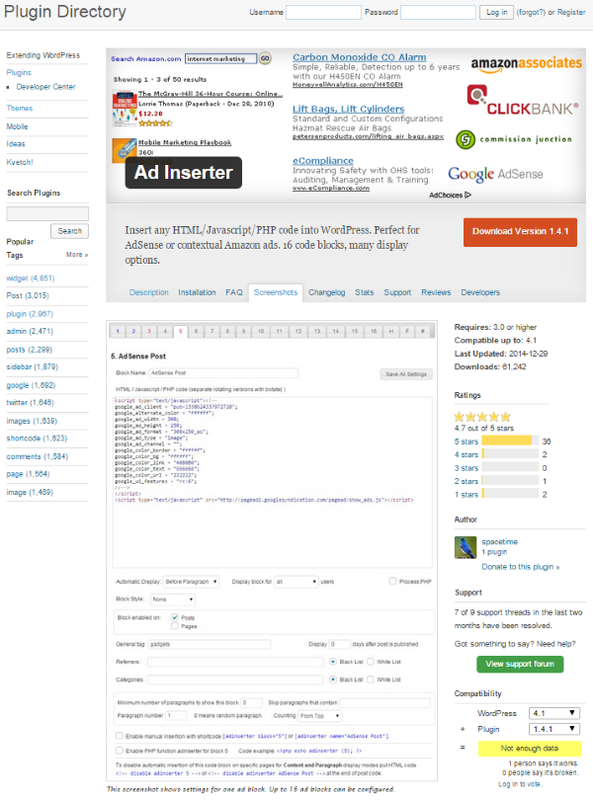 The ad blocks can be placed by hand-coding, plugins, themes, shortcodes, and more. You also have the choice of just placing an ad or fully integrating Google AdSense into your WordPress dashboard. 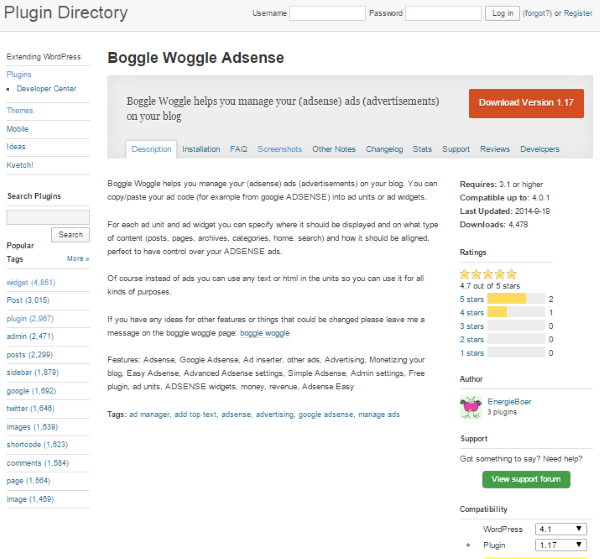 There are plenty of plugins and widgets to choose from to add AdSense to your website. Some are complete integrations, bringing your whole Google AdSense account into your WordPress dashboard. Others make it easy to place the code where you want it on your site. Some widgets and plugins have features that enforce the 3 ads rule and help protect you from accidently clicking on your ads (which will get your account banned from Google) by allowing you to exclude your IP from displaying the ads. They also help with location-placement. This section lists some of the best plugins and widgets. This is Google’s official plugin for WordPress. It adds AdSense and Webmaster Tools to your site. It comes with Automated Mobile Ads which adds mobile specific layouts and it has an easy to use ad management system. You can also manually insert ads into locations that you specify in HTML and interact with them with point and click. You can exclude pages from having ads as well. Webmaster Tools are built in to your WordPress dashboard, so you have everything you need in one place. This plugin is free. This one gives you a nice tabbed interface that includes all of the admin controls and options. It adds widgets to your sidebar and you can position and display ad blocks anywhere you want in posts and pages. It has a custom Google interface with color pickers that lets you adjust the colors and fonts to match your site. You can place the ads in the top, middle, or bottom, and align them by left, center, or right. There is both a free and a premium edition. The Pro version is $5.99 and adds a filter so your ads will only show on those pages that comply with Ads EZ Plugin for Google AdSense policies. This is a good feature because some comments can make your pages inconsistent with those policies. It also lets you choose computers where your ads will not be shown. This helps to prevent accidental clicks on your own ads so you don’t get banned by Google. This is a free plugin that adds your Google AdSense dashboard to your WordPress dashboard and will display your earnings. It has a widget called Earnings Dashboard that shows your AdSense statistics and reports in your admin panel on your website. It will show your total earnings, CPC, CTR, CPM, Number of Clicks, and Page Views. You can display the results based on a date-range such as today, yesterday, last 7 days, last 14 days, and last 30 days. You can set the access level so only certain users (editors, authors, etc.) can see the information. It will also improve your page loading using a cache system. 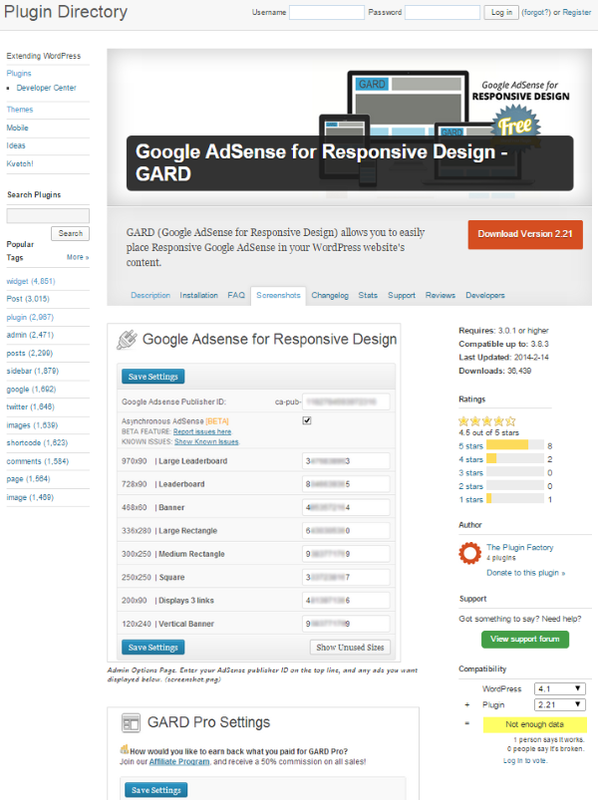 GARD stands for Google AdSense for Responsive Design. It lets you place responsive AdSense ads within your content using shortcodes. You have a lot of control over your ad-placement and the custom CSS styling options allow you to tailor it to suit your site. You can tell GARD which ads to choose from for placement. It’s AdSense policy compliant, so it only displays 3 blocks of AdSense ads on a single page or post. It also has ad groups, so you can have groups that are specific to links, banners, and so forth. There is a Pro edition that adds multiple ad groups, gives you the ability to auto insert ads, and more. It’s $34.95 for 1 site, $84.95 for 2-5 sites, and $124.95 for 6-10 sites. 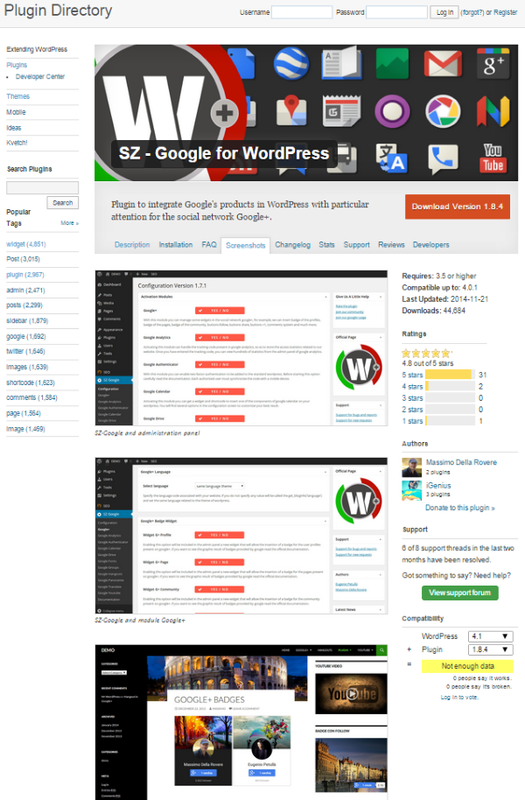 This plugin integrates Google products into your WordPress site with a focus on social networking through Google+. It has lots of Google-based modules that you can use independently. It also has a Google Analytics module that will generate code from your dashboard. Plus, it gives you control over positioning. It will add the code to your header and footer, or you can customize the position manually. It has functions to allow you to customize your theme through PHP. Each of the modules are independent of each other so you can activate only the modules you want and use them in any combination you want. This one will let you insert your ads into your posts and pages, as well as your sidebars. You can also add a Google Search Box. It enforces the AdSense policy of no more than 3 AdSense blocks on a single page. It comes with widgets so you can add a custom title to the content, have customizable text or image title for searches, and link units. You can place links in the header and footer. You can suppress ads on the home page and on pages if you want. And there’s a customizable mouse-over border for your ad blocks so they stand out in any way you want them to. You can also display the blocks based on the length of the post. Basically, you have full control over the positioning of individual pages and posts. 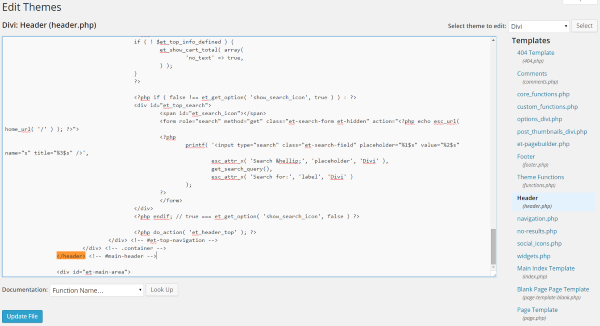 This one gives you ad widgets and ad units where you can paste your AdSense code. You can choose where each widget and unit will be placed and in what type of content it will be used with including posts, pages, archives, categories, home, and search. This one can also be used as a general purpose text widget as you can add any kind of HTML and text you want. The idea behind this plugin is simplicity. It will place AdSense code in up to 3 places in your existing and future pages and posts. It enforces the Google policy of no more than 3 AdSense blocks per page. Adding code is by copy and paste from Google and you can suppress ads on all pages, on the home page, or in the category, tag, and archive listings. You have full control over the positioning on pages and posts. There is also a premium edition. The Pro Version costs $3.95 for a single license and gives you a filter so your ads show only on pages that comply with Google AdSense policies. It also lets you specify computers where your ads will not be shown, so you don’t accidently click on your own ads. This free plugin allows you to insert ads into your posts as shortcodes. It has 16 different code blocks that you can manually place as shorcodes. It has lots of options that determine where the ad is placed within the post, and you can choose whether or not the ad is placed based on the post. For example, “do not display ads until post is x days old,” “do not display ads for x category,” etc. You can place the ads with various alignments including wrapping, left, right, center, floating left, floating right, and more. 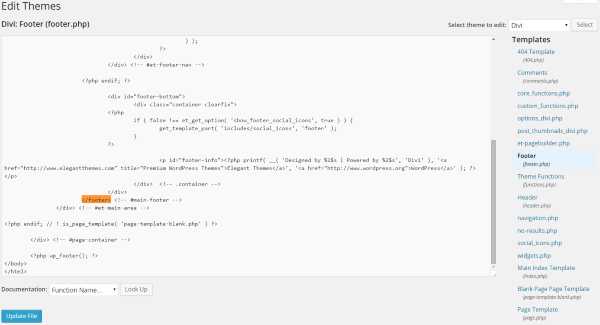 It also has support for header and footer scripts. 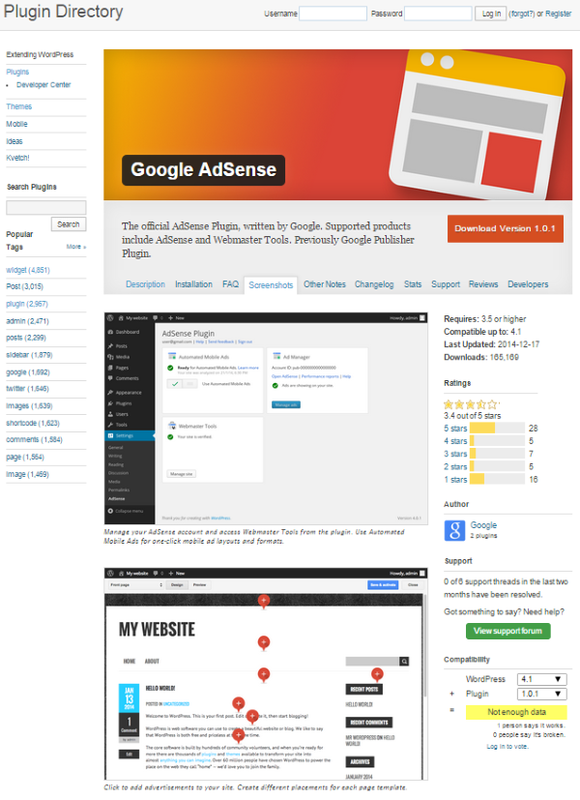 What if you don’t want to use a plugin just to add Google AdSense ads to your WordPress site powered by Elegant Themes? Well, you’re in luck because you don’t have to! You can manually insert your Google AdSense code directly into your ET epanel using the Integration tab. From the Integration tab you can add custom code to key areas in your theme, including adding code such as Google AdSense. 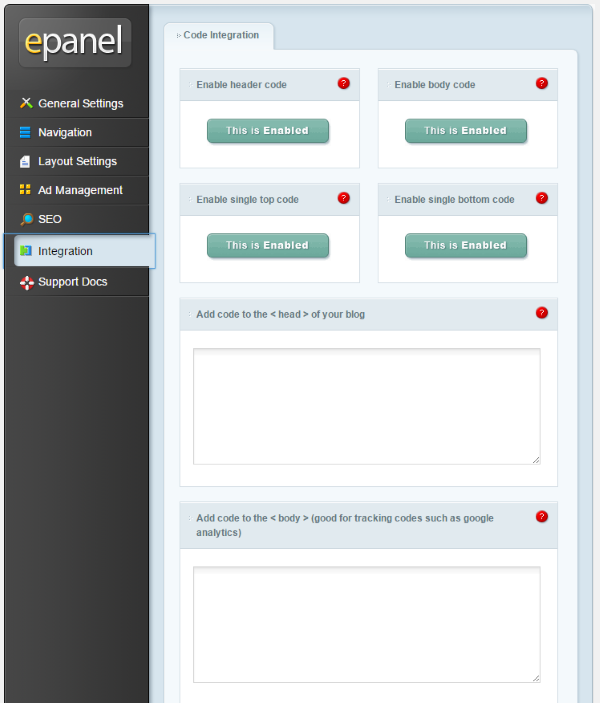 To do this, select Integration in the epanel. This takes you to the Code Integration options where you can add code to the header, body, top, or bottom. All you have to do is enable the area you want the code to appear, and then paste the code snippet that you got from Google into the proper text-boxes, save it, and you’re in business! Each of these locations can be turned on or off as you wish. Just keep in mind you’re only allowed to display 3 Google ads on a page or post – including the sidebar, header, and footer. Another way to place your AdSense code is manually pasting it directly into your posts and pages. You can even manually paste it into your theme’s header and footer, or directly into your theme file if you want. Adding AdSense code directly into your posts is simple. In the post or page editor, choose Text and paste the code where you want it to appear in the post. Once you publish the post the AdSense code will be displayed. One problem with this is your content will either appear above it or below it. So if you’ve placed the code in the middle of your content, the ad will break your content into two pieces. This works, but it might not have the look you’re after. Most like placing the code within the text, so the ad is to the right or left of the content and the content wraps around the ad. 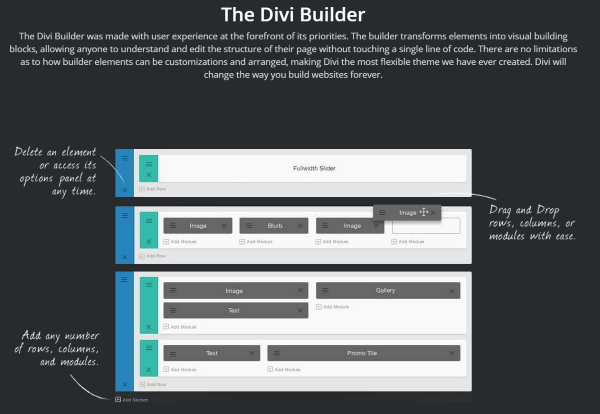 An easy way to do this is by using ET’s Page Builder plugin or Divi’s Page Builder. If you use either ET’s Page Builder plugin or Divi’s Page Builder to develop your page layout, then you can use a text block to place a block of code anywhere you want. You can have your content wrap around the AdSense ad, making it look seamlessly integrated within your content. This gives you a clean look and it doesn’t take much time at all to build. If you don’t want to place the code in every post manually, you can add it directly to your theme. There are many tutorials that step you through placing code within your posts. This code will allow you to manually add code into your theme files that will place wrap-able ads into your posts. In the Theme Editor click Single Post (single.php) on the right hand side from the Theme Files. To manually place your Google AdSense code in your header, go to Appearance > Editor and select Header (header.php). Now look for </header> in your header file. Place your AdSense code either above or below </header>. Next select Update file and you should have an AdSense ad in your header. To manually place your Google AdSense code in your footer, go to Appearance > Editor and select Footer (footer.php). Now look for </footer> in your header file. Place your AdSense code either above or below </footer>. Next select Update file and you should have an AdSense ad in your footer. Use the same alignment code as the header to place the banner in the center, align it to the right, or align it to the left. Adding Google AdSense code is simple, but getting it where you want it, keeping it limited to 3 blocks, and keeping yourself from accidently clicking on your own ads can be tricky. These methods simplify the process and give you full control over your ad-placement. How about you? Have you placed Google AdSense in your WordPress site? How do you manage your code? Do you use a plugin or one of the methods discussed here? Did I leave out your favorite method or plugin? I’d like to hear your thoughts in the comments below! What do we WANT!?!? …….. More Blog Posts! What do we PAY for!?!? …….. More Themes! We are nearing the 7 month anniversary of the first sneak peek of Extra. Every day and every blog post is like Christmas Eve for the Christmas that never comes. This post is about Adsense specifically, and is not a duplicate of the post mentioned. Nothing in this post was covered previously, so I am not sure what you mean. So do you guys even make WordPress themes anymore? Otherwise this is the most expensive blog I’ve ever signed up for. Thanks for listing GARD here! I’ve actually used elegant themes in the past for client projects, so it’s nice seeing my work listed here. That will get Elegant Themes readers 20% off any level of their GARD Pro purchase. I’m just especially against SZ – Google for WordPress plugin due to its heaviness and too many links going to Google’s cdns and privacies/securities issues… Maybe i’m wrong but i don’t like the way it’s working. Hi all, I tested many free plugins on this topic, and I use QUICK ADSENSE in ALL of my websites since 20010! I’ still waiting for a better plugin able to manage A/B and multivariate tests with adsense codes. Do you know a plugin with this feature??? Very helpful post Brenda, I would rather go with the official plugin from the Google, reasons being, it is coming from Google and then it is absolutely free. 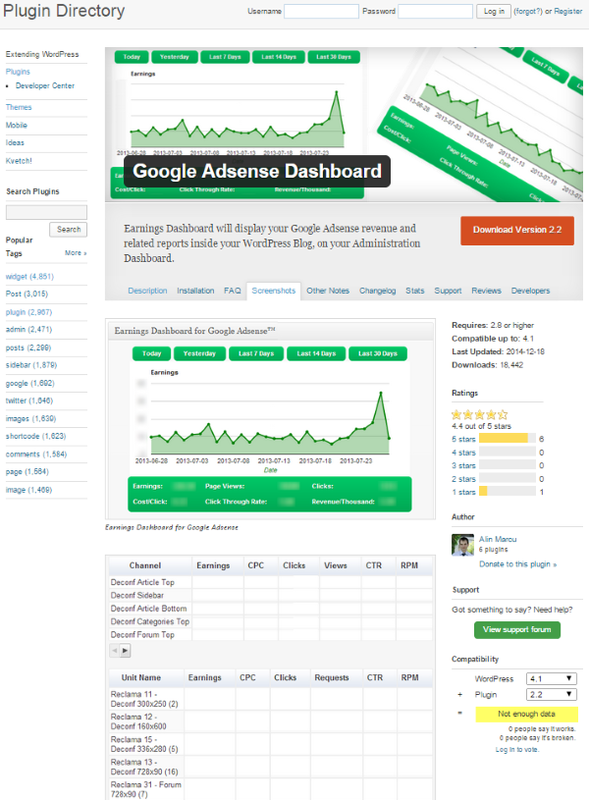 I use the plugin official of Google Adsense in my site. It is the best plugin of all. Thank you for share this informations. We were studying different options on adsense, betting affiliate networks and analytics tracking codes in the office this morning. I like the options of some of the plugins listed here, but confess to simply using the adsense code in a plain text widget space when using wordpress sites. We track conversions the old fashion way. In addition to finding out about how to place AdSense code, I had hoped to learn more about how lucrative AdSense can be. I used AdSense on my non-Wordpress site for a while but it never earned any money. Every once in a while, it would say a few cents (literally a few cents!) were being deposited into the bank account but it often never showed up there. Has anyone out there had better luck actually earning revenue by using AdSense? I am tempted to try it again now that my site is on WordPress (using Divi theme). Should I? This nothing but a long-narrative & informative Article where we may know 80% about using adsense. This article is exceptional because you up hold many useful plugins. A question has come to mind that which is better. Barron, would you answer me according to your practical knowledge? If you answer me it will be great pleasure to me. This was very helpful. I needed to read about the basics and this covered it well. Thanks. I’m having a program with Adsense on the free WP platform. I’m wondering if it’s because I’m using the free version but all my ads display as a yellow bar. I don’t know how to fix it and there are no plugins on the free WP. I have a number of sites using DIVI and just seeking some information on adsense placement. I have tried installing the official google adsense plugin but that was a disaster. I manually placed ads where I wanted them but google took over the site and littered my site with ads. This made the site look a complete mess. I only want to place ads manually so tried just inserting txt boxes with DIVI page builder. This works ish…. however it seems that you are limited where these text blocks can be placed because many of the ads where just blank place holders also this is no good for posts. Does anyone know if either of the plugins above will give me what I need? So in your prospective, which is better option? Using a Adsense enabled theme or a plugin to do such Ad management tasks?